The warmth of real leather pairs so well with the clean, metallic sheen of today’s electronics. I never tire of feeling and smelling this old-world material while using cutting edge technology. The folks at BUKcase have added a very simple series to their product line for iPhones and iPads, which they call Cote. I was sent a review sample for both the iPad 2/3/4 and the iPhone 5/5s/5c to test, both in Wenge (which looks fairly black on their website, but is in actuality a reddish brown). Note: Photos can be tapped or clicked for a larger image. Overall, the design of these cases couldn’t be simpler: it’s a single piece of leather, scored and folded into a triple-layer sleeve that is open on the top, and stitched down one side and across the bottom. 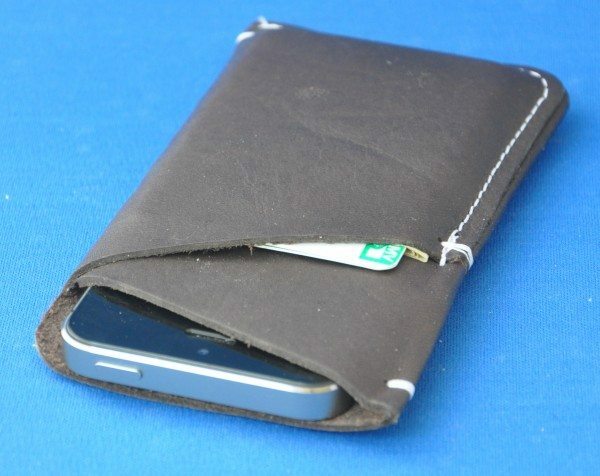 This gives you a compartment to hold your device and a second one to hold papers, ID, cash or what-have-you. True to most leather products, the fit is at first tight, but quickly wears into being just snug enough. The leather itself is an Italian leather, thick yet pliable. It’s not full-grain, stiff leather like a bridle or harness, but it’s not thin and soft like racing gloves. It strikes that sweet spot in between. The stitching (white on the wenge, green on the tan models) is top-sewn, and bound off at each stress point. 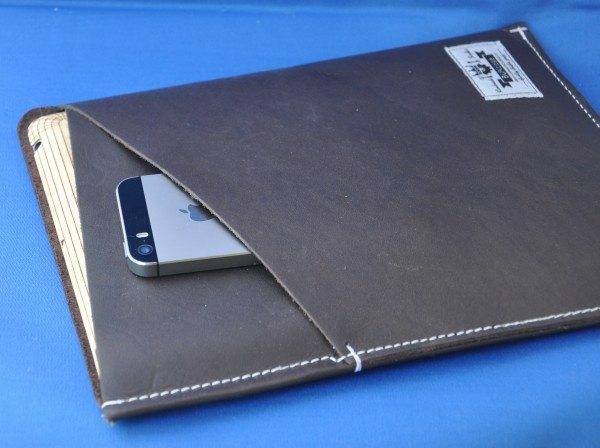 The iPad slides in with just a whisper of leather above to protect it, while the iPhone backing only comes to the same level as the phone. The iPad depth is spot on, but on the phone, I’d have liked a few more millimeters in depth. 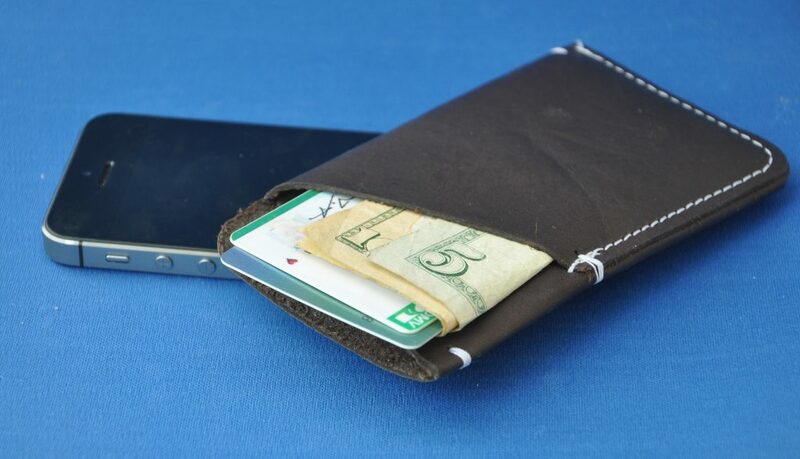 The second slot of the iPhone case can easily hold 2-3 ID/Credit/Debit cards, as well as a few bills but that’s going to be tight. Two cards is a good fit. 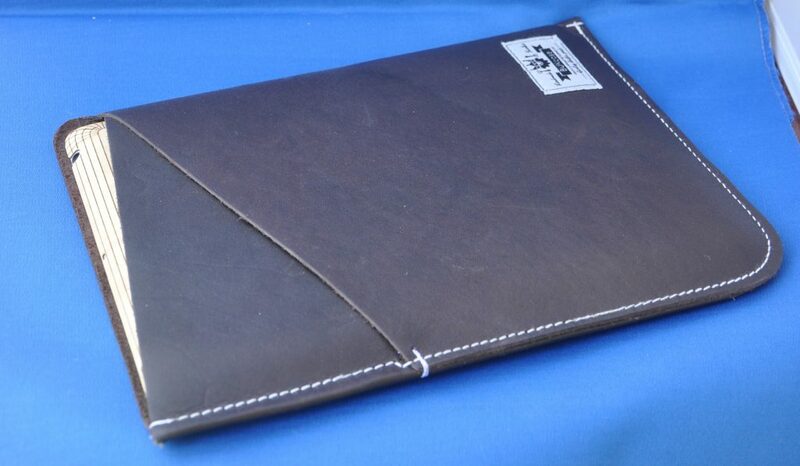 The iPad model, because of it’s larger width, can actually hold an iPhone in it’s Cote case easily. A naked iPhone almost rattles around. You could clip a pen or stylus in, but most chargers are going to be a no-go. Flat is where it’s at. Overall, I am really in love with both cases, but I think the phone case will not be in my EDC list very long. I’m a fan of using my iPhone naked now, but slipping it in and out of this sleeve, no matter how nicely protective, is a bit of a hassle. I miss grabbing my phone, flipping it around in my single hand while turning it on and holding it up to my ear in one swift motion. With a sleeve, I have to get the phone out with one hand, pinch and pull it out with the other, then press the Touch ID button to answer the call. That’s a bit fiddly for me. And the case is still pretty snug, so there’s that as well. At £50 (about $84 at this writing) for the iPad size and £25 for phone size (There’s one for Galaxy and iPhone 4/4s as well), these are a bit on the pricey end, plus those outside the UK will be hit for international shipping charges. The quality of materials and manufacture is first rate, and I’m sure they will last many years, probably far beyond the current form factors of tech. You’ll have to decide if it’s worth it for your budget. Visit BUKcase for more info. Durable - wear will develop more patina over time. Holds device and a few flat items with ease. 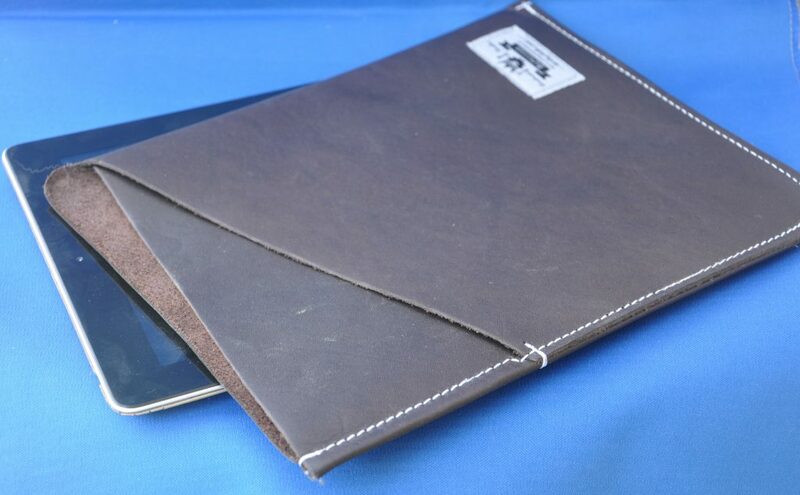 BUKcase Cote for iPad and iPhone 5/5s review originally appeared on The Gadgeteer on May 2, 2014 at 4:00 am.